News Corp’s national broadsheet The Australian officially has double the circulation of rival Australian Financial Review’s Monday to Friday print circulation, the latest audit figures have revealed. Despite a 2.10% year-on-year decline, The Australian remained above the 100,000 copies a day mark, with a Monday to Friday circulation of 101,980. 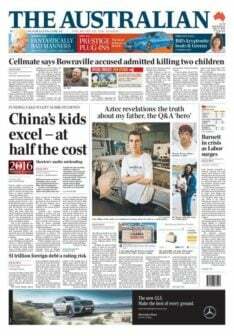 Fairfax Media’s AFR posted a decline of 10.50% with a Monday to Friday circulation of 50,288, giving The Australian a circulation of double that of its rival. In positive news for the AFR, its weekend edition bucked the declines to post a modest growth of 0.7% with a circulation of 62,345, up on the 61,911 copies it was selling in the January to March period in 2015. The Weekend Australian posted a decline of 1.20%, with its circulation going from 230,182 to 227,465. Andrew Jaspan, editor of The Conversation and former editor of The Age, told Mumbrella: “What’s happening at the Fin, because it has a 10% drop year-on-year and is the only paper that is up year-on-year at the weekend, people are saying with the Fin that they don’t need a print paper during the week because they can get their information from other sources. “But what they want at the weekend is something that makes sense of the week and they feel that the weekend Fin is that kind of a read, a kind of a catchup, make sense of the week which is the way I think print products will end up going. Looking at the digital subscriptions, Fairfax Media’s have once again declined quarter-on-quarter as The Age posted a year-on-year decline for the second audit in succession. The Sydney Morning Herald only just managed to report growth in its digital subscriptions, up 0.9% year-on-year. It still boasts the largest digital subscriptions, reporting 134,934 paid digital subs during the January to March period, up on the 133,702 subscriptions the masthead reported in the same period last year. Despite year-on-year declines, The Age reported the second highest digital subs with 125,038 paid digital subscriptions, down 3.4% year-on-year and down 6.3% quarter-on-quarter. Last Friday Fairfax CEO Greg Hywood told investors the publisher would cease printing weekday versions of the SMH and Age in the future, and focus on digital revenues. The publisher is currently in the process of cutting jobs to save money. Former Age editor Jaspan told Mumbrella: “Greg Hywood has said the future is digital and he’s made it clear that he sees the Fairfax papers getting out of print. News Corp’s Herald Sun posted the highest digital subscription growth, up 29% year-on-year and 2.92% quarter-on-quarter. The masthead reported it had 68,823 paid digital subscriptions during the January to March period, compared to the 53,112 it had in the same period last year. News Corp’s The Australian posted healthy year-on-year digital subscription growth of 14.3% and 3.13% quarter-on-quarter. The broadsheet reported 77,371 paid digital subscriptions, up on the 67,561 paid subs during the same period last year. Michael Miller, executive chairman of News Corp Australaisa, said in a statement: “We are encouraged to see strong growth in digital subscriptions, the ongoing growth of our multi-platform audiences and a continued slowing of the decline in print circulation. News Corp still refuses to release digital subscription data for the Daily Telegraph, The Courier Mail and Adelaide Advertiser. Looking at the Monday to Friday print circulation, The Canberra Times posted the greatest decline, down 9.5% year-on-year with a circulation of 18,326. The Courier Mail was the second hardest hit, with a Monday to Friday circulation of 139,403, down 9.3% from the same period last year. The Sydney Morning Herald posted a year-on-year decline of 8.7%, with its Monday to Friday circulation inching closer to the 100,000 copies. For the January to March period the SMH sold on average 102,512 copies, down from 112,229 in the same period last year. The Northern Territory News saw its circulation slide under 13,000, posting a year-on-year decline of 8.4% to sit on 12,415. Fairfax Media’s The Age posted a decline of 7.9%, down from 104,370 to 96,120. The Advertiser saw its Monday to Friday circulation slip by 6% to 125,258 as the Daily Telegraph slid by 5.3%. News Corp’s Daily Telegraph was the second-highest selling Monday to Friday newspaper with a circulation of 241,372. The Mercury holds on with a circulation just above 30,000 despite a year-on-year decline of 4.2%. It posted a circulation of 31,522. The West Australian, owned by Seven West Media, slipped to 140,611 from 153,763. The Herald Sun posted the smallest year-on-year decline of 3.10% to remain the highest selling Monday to Friday newspaper with a circulation of 331,715. Looking at the Saturday editions, The Daily Telegraph fell below 250,000 copies sold on average, posting a decline of 6.5%, dropping to 247,946 from 265,111 in the same period last year. The Saturday edition of The Herald Sun continued to be the highest selling with a circulation of 342,546 despite a year-on-year decline of 3.10%. F airfax Media’s The Sydney Morning Herald saw its Saturday circulation slide by 7.8% to sit on 191,728 as The Age also declined by 7.8% to a Saturday circulation of 164,774. Fellow Fairfax Media title, The Canberra Times reported a circulation decline of 10.9% year-on-year to fall to 28,210 down from 31,652 in the same period last year. Northern Territory News’ Saturday edition posted a circulation of 17,318 down from 18,999. That’s a decline of 8.8%. The Courier Mail was down by 9.6% to 180,050 as The Advertiser saw its Saturday circ slide by 5.4% to 167,357. The Mercury’s Saturday circulation dropped by 6.6% to 42,609 as The West Australian posted a decline of 3% to 242,298. Amongst the Sunday editions, The Sunday Telegraph dropped below 450,000 copies sold for the first time, posting a circulation of 434,045 for the January to March period down from 466,967 in the same period last year. The audit results for the October to December period of last year pegged the paper as having a circulation of 452,377. Fairfax Media’s The Sun-Herald reported a decline of 12%, slipping below the 200,000 mark. For the January to March period the Sunday newspaper had a circulation of 196,060, down from 222,873 in the same period last year. The Sunday Age posted a circulation of 133,562, down 8.2% on the same period last year while the Sunday edition of the Canberra Times saw its circulation slide by 9.3% to 19,311 from 21,284 in the same period last year. The Sunday Mail in South Australia posted a year-on-year decline of 4.2% dropping from 211,386 to 202, 567. However, it was up on the previous quarter (October to December 2015) when the paper reported a circulation of 200,264. The Sunday Tasmanian also grew quarter-on-quarter with a January to March average circulation of 40,414, up on the October to December 2015 quarter average circulation of 40,232. However year-on-year the title was down 4.4%. Queensland’s Sunday Mail’s circulation was down 9.7% year-on-year from 359,088 to 324, 167 while The Sunday Herald Sun’s circulation declined by 3.6% from 407,213 to 392,394. Western Australia’s Sunday Times reported a circulation decline of 7.8% from 407,213 to 392,394. The Sunday Territorian posted the smallest decline of 0.9% from 14,136 to 14,003. I don’t understand why all of the papers keep on plummeting. It’s not like the Internet was just invented and people have suddenly discovered online news. Are readers seriously cancelling their subscriptions because all their news needs are now satisfied by click bait? Hywood can soon take credit for killing off Australia’s best newspaper. On his watch it’s collapsed into a poor imitation of the Oz and on these figures is probably losing as much money. I keep looking forward to reading the Australian knowing that it gives good comment in contrast of the Fairfax left-wing rubbish. What is the AFR’s digital subscription trend year on year? You’ve emphasised the decline in print compared to the Australian, yet haven’t provided the same comparison for digital subscriptions. 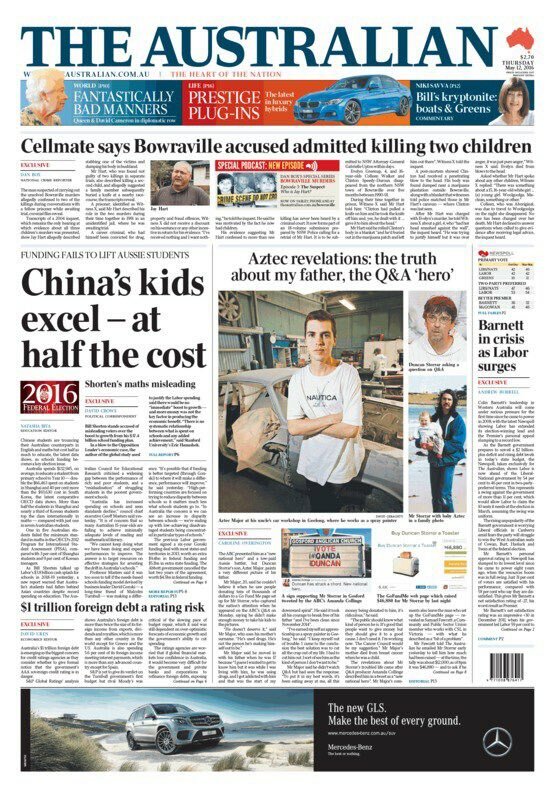 Fairfax doesn’t release the digital numbers for the AFR. There we were thinking that digital will kill the Tele or The Age. Suddenly it looks like the AFR is dead on its feet, killed by a management that has no feel for its customer. Criminal. Meanwhile, the SMH has nearly double the digital subscriptions of The Australian. The Oz also ran a promo not long ago handing out free tablets with digital subs. You would expect a rather large jump with such a generous offer. It’s basically buying subscribers. Hey Miranda – I really like the interactive charts you’ve added to Mumbrella. What program or app do you use to integrate them into your content? Please share! Newscorp likes to bundle it’s print editions with digital subscriptions. Has this put any sort of brake on print decline? The Australian’s rival is the AFR? Since when? Comparing oranges and grapes is one thing but shouldn’t the comparison be between the Oz’s real rivals – Telegraph/Herald Sun/Courier Mail etc and SMH/Age? Good point. There was a time when the AFR was a business news specialist and the Oz was the paper for elderly Victorians retired to the Gold Coast. But the current Fairfax regime took the AFR on a sharp turn toward the Oz, hiring an editor who’s actually flunked out running the Oz with the evident aim of copying it. So now the AFR is full of pious opinion and desperate claims to influence and straight thinking (familiar, Mr Mitchell?). This was followed by a stampede of business readers for the exits, which led to what has been a series of shrinkages in mainly specialist business staff and amplification of the foghorns of opinion. Meanwhile News has been working at every option to fill the spaces Fairfax retreats from and the AFR is the number one target. Which is why they have beefed up their business section etc. Sadly the result is that we now have two dailies shouting opinions in the undergrad style of The Spectator (oz edition) and no business newspaper. If that was the case The Advertiser would have closed long ago. Thanks for picking up that – I’d left out a very important 5 – the correct figure is 125,258. Do note that The Australian’s circulation includes 20,000 (yes, 20,000) bundled sales to airlines, hotels and other assorted organisation versus 6,000 for the Fin.